A Jotul wood heater, available from Real Flame Geelong. As the crisp Autumn days start to roll in, I recall my childhood home and how the wood heater was lit for the first few times in the season. The glow of the heater would radiate out into our living area and become the heart of our home right through the cooler months. As children we would congregate around it to warm our numb toes after a day at school, captivated by the golden flickering flame, and there was always an endless row of carefully orchestrated clothes horses around it. Perhaps my fondest memories are of my mother carefully washing raspberries freshly picked from our backyard vines and placing them in what seemed the hugest of pots as a child, and onto the top of the wood stove it went. It slowly bubbled and brewed, sending out the most unforgettable aroma and eventually it became the sweetest jam to be smeared on our morning toast. It seems many of my fondest childhood memories included that robust wood heater. 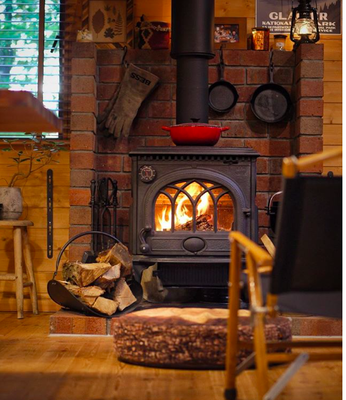 Our Jotul wood heaters are timeless products that bridge the past and present. With their Norwegian craftmanship they offer both traditional character, but also integrate with the architectural qualities of modern living spaces. With their sturdy cast-iron body they will warm a home and create memories for a lifetime, all whilst being incredibly energy efficient. Call into our Geelong West showroom, at shop 2a Gordon Ave, to discover your perfect winter heater, or catch us at the annual Lara Food and Wine Festival this weekend.